I have carried a lot of pistols over the last 18 years but none have felt as easy to carry or a concealable as the little S&W Shield. In my opinion, this is the world’s smallest fighting pistol, beating out all other micro-pistols in almost every metric. Of course, none of this matters if you don’t have the best holster for M&P Shield to go with it. Of course, any of these holsters will fit .40 S&W Shields as well and most companies produce the same holster should you want one in .45 ACP. Shields are very popular handguns right now and most companies produce holsters for them. Not all of these holsters have the quality or craftsmanship needed for a good carry rig. Nor are these the only good holsters. There are many manufacturers with quality products out there. We attempted to pick holsters that you could purchase and have in days instead of waiting weeks or months. 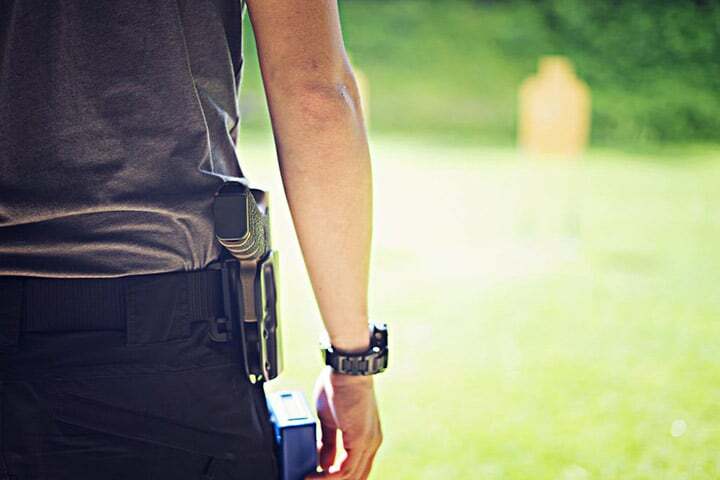 The following are considerations for any holster for a Shield and most other handguns. The most common materials for holsters are leather and Kydex. For some time now, hybrid holsters that use both materials have been available. 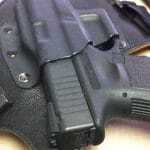 You may also find holsters made of neoprene or other soft, moldable materials. Leather is a solid choice. I find leather to be more comfortable than Kydex and better fitting. It molds to the gun and has good retention capabilities. Leather can be slower to draw from. Kydex is the fastest material. Drawing from a Kydex holster is very quick and easy. If molded well, it has very good retention. 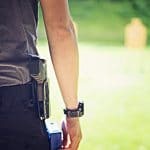 Many people find Kydex holsters less comfortable. I am not a fan of hybrid holsters like the Crossbreed Supertuck. They are fine when new but as they wear, they lack support and retention. Eventually, it gets to the point where re-holstering your weapon can become dangerous. 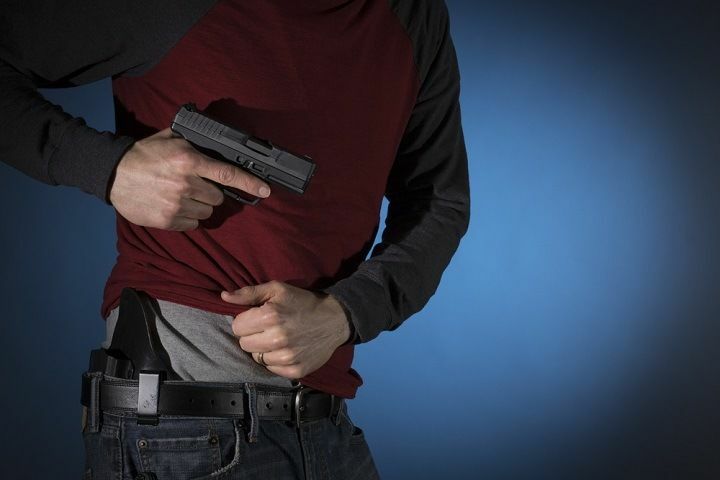 Avoid any soft-bodied holsters with the rare exception of a pocket holster. I would only use those for a revolver and by any count, fitting a shield in your pocket would be a little tricky. The normal carry positions are IWB, OWB, appendix, small of back, pocket, and ankle. Each of these positions has some benefits. Some have devastating negatives. Where you carry depends on your body shape more than anything and not everyone can carry in the same positions. Other than my large revolver for bear country, I carry most pistols IWB. Unless you are packing a full-size handgun, it is far easier to concealed carry IWB than most other methods. This should be the standard. OWB is acceptable when you have proper clothing for concealing your handgun. I am not a fan of open carry. I do have several OWB holsters that work very well, usually because they ride quite high. I carry my shield and most other smaller firearms in an appendix holster. It is the fastest location and far easier to conceal a small handgun that IWB on your side. Many holsters are now made that can be worn appendix or IWB. I do not recommend small of back holsters. It is harder to see if your gun is printing and even harder to quickly draw from. Re-holstering your firearm is blind and can be very dangerous. Unless your physiology demands you carry in small of back, don’t do it. I carried a small S&W revolver in my pocket for some time. I did it because the demands of my job had me removing my holster to go into government buildings. A pocket holster was the most convenient method to carry even if it was slow and awkward to draw. Ankle holsters are fine for a backup gun but are very slow to draw from for a primary self-defense tool. There are a number of great and very comfortable ankle holsters if that is what you want. They just aren’t optimal. If you do get one, make sure it’s a good one that fits well. Those above are the traits you will have to decide on. Below is a list of traits that all holsters should have. When carrying your firearm, this is what will keep you safe and your firearm secure. If your holster does those things, it should be successful. If it does those things and is comfortable to wear, you have found an adequate concealed carry holster. There is a lot to be said about the classic Kydex shell holster. They are effective with very good retention and last forever. It’s very hard to go wrong with a holster like this as long as it is well made. 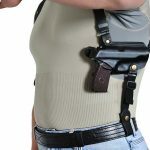 In the case of the CYA, it is immediately apparent that this holster was designed by people who carry guns frequently. The holster rids well at a good angle for IWB side carry with the perfect cant. Even the clip works we and holds securely but is easy on, easy off. Retention on this holster is phenomenal when properly adjusted. You want it firm enough to hold the pistol upside down but not so firm you yank the holster off your pants when you try to draw. Several Allen screws can be adjusted for that perfect fit. 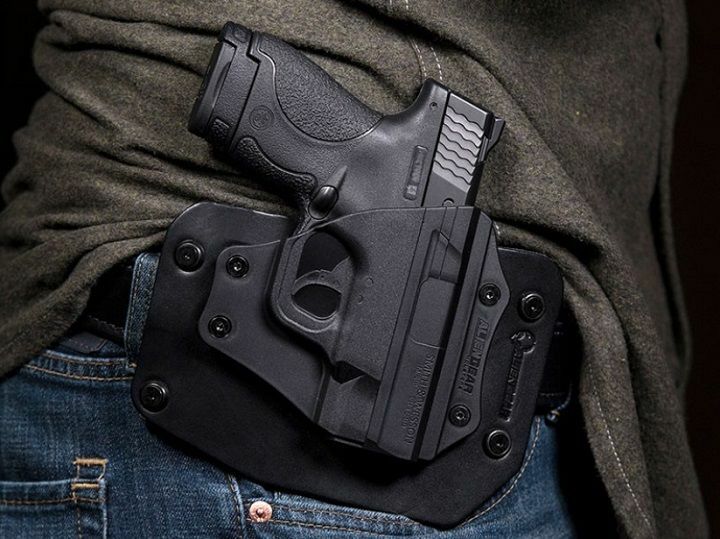 If you want to carry appendix, this compact holster is perfect. Just adjust the cant (carry angle) to 0 vertical or close to and you are good to go. This makes the already good CYA Supply So. S&W M&P Shield 9/40 IWB holster even better and more versatile. I won’t deny my love is for a good leather holster. I prefer it over Kydex but if it’s poorly made, it will have more problems than it is worth. For a steal of a price, Outbags has produced a very decent holster that is quite attractive. The first thing I look for on a leather holster is a reinforced throat and we have that. This makes the gun safer to re-holster. Next, I want good retention since it does not have a snap. I have seen holsters with a better fit, but for the price, this one does the job and holds tight. Carried on your side it will work better than appendix but both are secure enough. The clip on this pistol is fairly ordinary and a wider clip may be more comfortable. That said, this holster does a good job of hanging on to a belt and has decent support. Even a thick waistband is probably enough. When it comes to value, the Outbags USA is quite a good holster! There is a lot to be said about the Shield’s ability to be concealed even on an OWB rig. 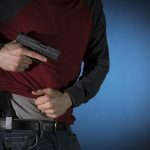 There is even more to be said about Alien Gear holsters that manage to squeeze into a tight budget with a decent product. If OWB is your style, this is the holster for you. Much like all Kydex shell holsters, the Cloak has a stiff throat that makes re-holstering safe and easy. The click in retention is as good as any holster out there but the addition of a steel plate behind the pistol increases that retention. This holster can be worn as a paddle holster which is quite comfortable and very secure or switch it out for a belt slide. Similarly, retention can be adjusted to where you want it. This makes carry very easy. I also love that this holster has an adjustable cant for carrying just how you want to. It is a quality product at a great price. The Alien Gear Cloak OWB should be on your short list. Has a lifetime warranty but even better, you can wear it for a month and they will buy it back if you don’t like it. I hate to double dip in the holster market with so many great holsters but Alien Gear makes a good tuckable IWB holster. I know I said I wasn’t a big fan of hybrid holsters but let me tell you why I like this one. For one, the backing isn’t leather and doesn’t get as floppy as leather does. The edges are reinforced to keep them from getting droopy. This keeps the back material out of the way of the trigger and makes for a very nice holster. This style is by far the most comfortable to carry. The support you get is next to none. They ride high, ride well, say in place, and have great retention. You can also get this holster should you need an M&P Shield 45 IWB holster. Being an Alien Gear, you can customize almost everything about this holster including the height, cant, and retention. All done with Allen Screws. Like the last Alien Gear, the Cloak Tuck has the same 1-month satisfaction guarantee and lifetime warranty. If you demand an ankle holster, you need the best one. If you aren’t familiar with DeSantis, they are probably one of the hands-down best holster makers in the world. Their track record goes back decades. This is someone I would trust with an ankle holster. The leather shell has near perfect retention and is perfectly molded with a thick strap for extra hold. This is matched with a lined, elastic band that rides well on the ankle and doesn’t move around. The mouth of the holster is reinforced for optimal re-holster. The fit and finish are near perfect and the price is just hard to beat. Your pistol won’t flop around or move, it stays right where it should be. 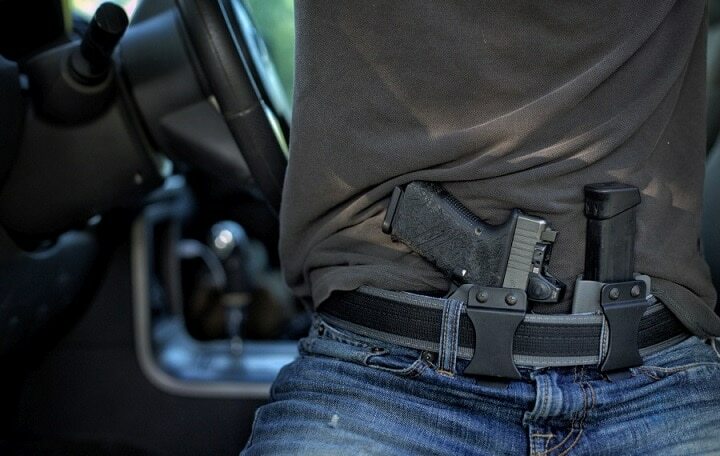 What more could you want out of a holster? The end result is a supremely comfortable holster made by experts for those serious about deep concealment. This matches perfectly with a Shield. If you want an ankle holster, there are very, very few that can compare. Firstly, your selection of a Smith and Wesson Shield should be applauded. It is one of the finest small carry guns made. This is an inarguable fact. It is a durable and solid tool for the job. Now that you are ready to pair it with the perfect holster, you will have one of the best small rigs available for your personal defense. As long as your holster meets the criteria above, you are well on your way. Don’t skimp or you may regret it. Get a good belt and you will have everything you need for your rig. These best holster for m&p shield 9mm will last a lifetime and so will your Shield. You should settle for nothing less when your own personal safety and the safety of your loved ones could be on the line. Eric has been an avid hunter and outdoorsman since his childhood in Appalachia. Having spent the majority of his time in various outdoor activities in many regions of the U.S. he has gained an appreciation and insight for the challenges of hunting different environments and game animals. He is an avid archer, fisherman, hunter, and gun enthusiast. Currently he devotes most of his time to education for young hunters and teaching outdoor skills for local scout troops and Search and Rescue orginizations.